We can tow all types of vehicles from compact cars, vans and SUVs to light trucks (no heavy duty or semis). We also offer a variety of additional services, including roadside assistance. We have all the equipment to handle vehicle recoveries from cars, vans and SUVs to light trucks (no heavy duty or semis). We offer safe storage in a secured lot to store your vehicle. We are licensed, bonded, and insured. Contact us or call us at 608-592-3722 for any Towing and Recovery needs! 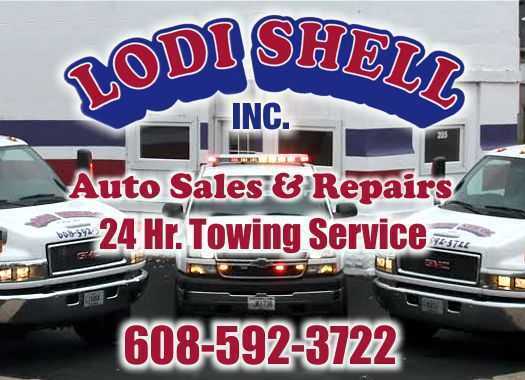 Page Summary: Lodi Shell offers tow truck, roadside assistance, towing and towing service. Products and services such as towing company, tow truck service, tow service as well as tow truck company are also part of the scope of our business. We also specialize in towing services, 24 hour towing in Dane, De Forest, Waunakee as well as Lake Wisconsin. Other areas we serve include Merrimac, Poynette, Lodi and Arlington. We also service Middleton, Sauk City and beyond.